The German 10 DM silver coin was minted between 1987 and 1997 and the coin displayed on our website belongs to this last year of mintage. The idea behind the issuing of this coin by the German government was the commemoration of an anniversary: 100 years since the apparition of the diesel engine. The German 10 DM silver coin has a low purity among other silver bullion coins. Its fineness is of 0.625. Therefore from the overall weight of this Germanic coin which amounts to 15.5 grams, it remains a 9.69 grams weight of pure silver. The German 10 DM silver coin also has a diameter of 32.5 mm, a kind of small diameter. The obverse of the German 10 DM silver coin illustrates, at is expected, the reason for this commemoration. It is an engraver of a large diesel engine, designed until its smallest detail is noticeable. The inscription translates in how many years have passed since this commemorated invention 100 JAHRE DIESELMOTOR. The reverse of the German 10 DM silver coin depicts the Germanic symbol that is present an almost every German coins, no exception if they have been manufactured from gold or silver. 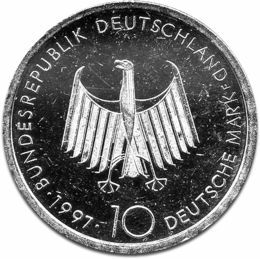 The tail side of the German 10 DM silver coin depicts a German eagle accompanied by the following, disposed in a circle, inscriptions: BUNDESREPUBLIK DEUTSCHLAND, 1997 issuing year, 10 DEUTSCHE MARK face value. The German 10 DM silver coin has a special role for Germans and also people around the world the German 10 DM silver coin. It reminds people of how powerful the German Mark was, before the adaptation of Euro it was the second currency after the US dollar, as economic importance. The above mentioned reason could be a strong reason for acquiring the German 10 DM silver coin. It can be considered, besides being a bullion silver coin, a commemorative coin even though it was not intended to be commemorative for this reason but for the celebration of 100 years since the diesel engine. It is one of the many coins, whether in silver or gold, that celebrates the greatness of this currency that was in 2002 replaced by the Euro, which at its turn became the second largest currency after the US dollar. The main reason for which people should invest into the German 10 DM silver coin is its incredibly low price. This is due mainly to its low purity, however let’s not disregard the fact that it still contains almost 10 grams of pure silver and that it is appreciable. It can also be offered as a gift to an individual that has made a passion from engineering. The German 10 DM silver coin it will be that kind of gift that is special and gives an expensive aura, when in fact it is not. The German 10 DM silver coin is available on our website at a price to which it is added a small VAT to the NETTO price.